With strawberry season right around the corner, I have been searching for some new strawberry recipes. I came across this one from the Our Best Bites cookbook and decided to make them for a summer cookout this past weekend. The recipe was simple and just a little bit fussy, but everyone at the party raved about these strawberries. This recipe is definitely a keeper! Mixed the softened cream cheese with the powdered sugar and almond extract. Set aside. Using a knife, slice the strawberry about 3/4 of the way down from tip to stem, being careful not to cut the strawberry in half. Then, slice the strawberry the other direction, so you have made at “X’. 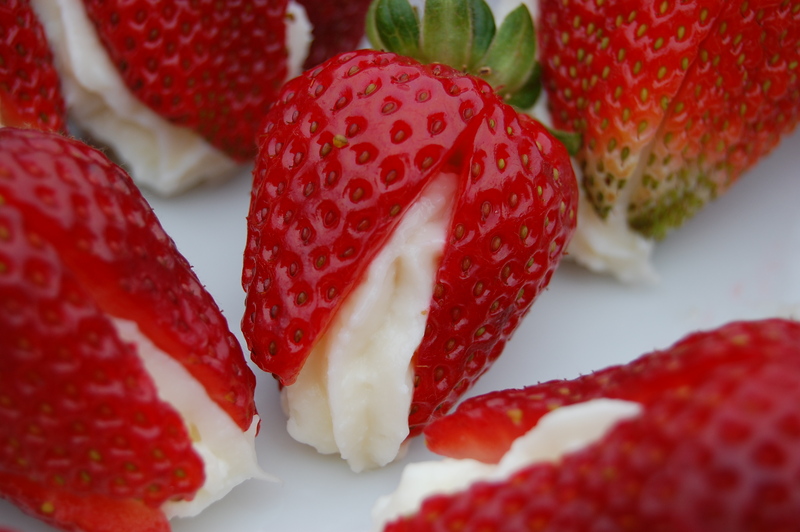 Fill a pastry bag with the filling and, using the star tip, fill each strawberry with the cream cheese mixture. These can also be drizzled with chocolate or even half filled and then chocolate dipped, like Stef’s mother-in-law suggested! Next time I will most definitely add some chocolate. What an awesome cocktails & dessert idea!! I can’t get enough strawberry recipes these days and won’t easily stop thinking about these. . . These look so great just had to share on facebook! Thank you for the idea! What a fun, easy and beautiful dessert! Looks fantastic! Made these for a bbq this past weekend – sorta. I instead spread the cheesecake filling on graham crackers and topped them with strawberry slices and blueberries. They were the first thing gone!! Thanks for another great recipe! Yum…that sounds delicious! I am to totally going to try that. Thanks Traci! I found your blog from Cat at brideblu and I love your posts! 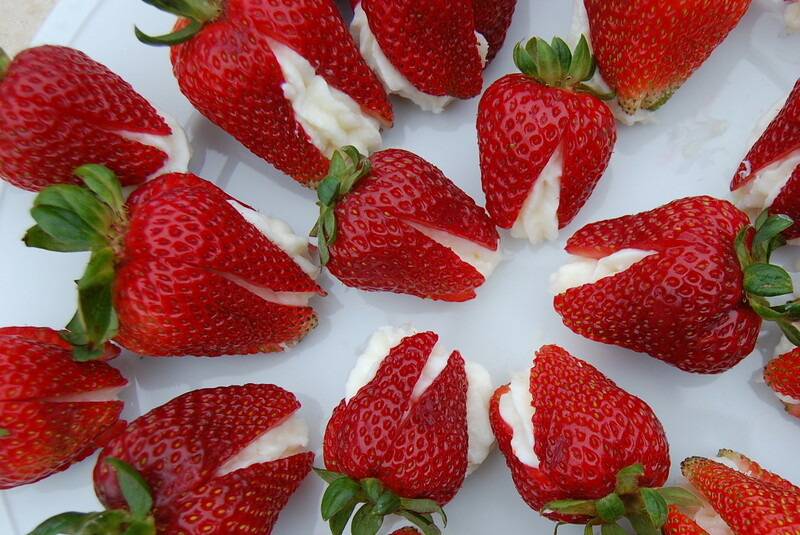 I’ve seen cheesecake stuffed strawberries on several different blogs, but yours definitely are the prettiest! Thanks for the idea Anne, they turned out great for Father’s Day. These are so pretty! We’re having a big barbecue in a couple of weeks – I can’t wait to serve them!